This Housolution Water Thermometer features instant and accurate readout and right size for baby to grasp, it is very great for baby swimming pool, hot spring use. It is great easy to use. Simply insert the long temperature probe into bath water and get wonderful feeling of washing every single time. Environmentally friendly products use advanced materials, PVC. ♥ Display accurate temperature results in 1-2 minutes and read it after removing from water. ♥ It floats on the water surface, easy and safe for your baby to play with. ♥ Light screen and clear digits ensure easily readout. ♥ With Celsius displays. Measurement Range: 0 ℃ to 50 ℃, which equates with 32 ℉ to 122 ℉. ♥ Cute Appearance, attracts your baby to play with it, that ensure your baby have fun in bath time. ♥ Plastic sheath safeguard the probe when not in use. ♥ 35 ℃ to 39 ℃ is served at the right temperature. ☘ NEVER use the thermometer in a closed oven. ☘ Clean thermometer and probe with a damp cloth before and after each use. ☘ Do not use corrosive chemicals for cleaning. ☘ Keep it away from fire. ☘ This product must be used under adult supervision. ☘ Please check the product before each use. If any damage occurs, please replace it in time. PREMIUM MATERIAL: A well built themometer made of environmentally friendly material PVC, suitable for both indoor and outdoor use. ACCURATE READOUT: High precision temperature sensor ensures an accurate temperature readout, providing a flexible temperature reading range from 0 ℃ to 50 ℃ . 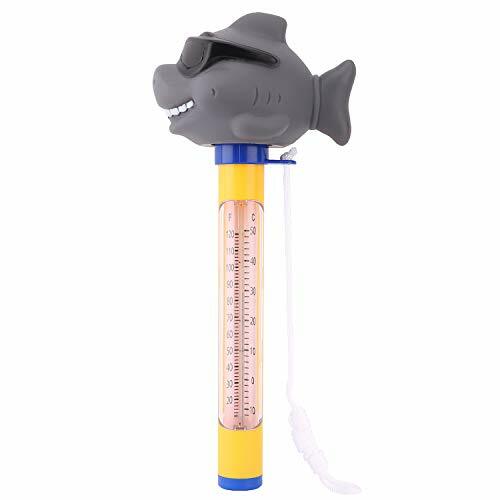 DUAL-PURPOSE: It can be used as water themometer or bath toy, which can offer a pleasant time for both your baby and you. GREAT HELPER: No worry about the bath water is too HOT or too COLD. The thermometer is an accurate and convenient way to monitor the correct temperature of bath water. LOVELY And EXQUISITE DESIGN: Cute cartoon design, and ready to float in the water and promote the fun of bathing. If you have any questions about this product by Housolution, contact us by completing and submitting the form below. If you are looking for a specif part number, please include it with your message.